Check the payment report created for [recipient's email address] as you just ordered. The attached Word documents were approximately 70 kB in size and password-protected. The document file names started with the string of alphanumeric characters from the subject line followed by the recipient's email address. File names all ended with the .docx file extension. This diary documents my investigation into this wave of malspam. We're always thankful for people who submit samples of emails and malware like this to the ISC. The email appeared somewhat common for most malspam we see. People sometimes think if malsapm has the recipient's name in the email, it must be targeted. However, that's often not the case. This type of malspam is easily automated, and it can seem convincing when the recipient's email address is formatted as firstname.lastname@company.com. 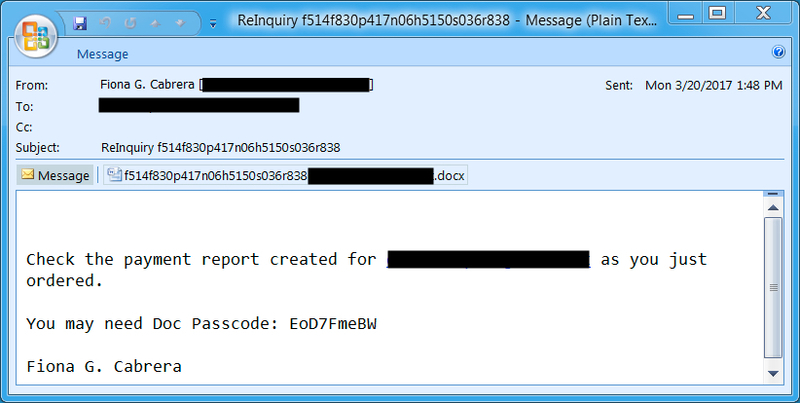 The document would only open after using the password from malspam it was attached to. 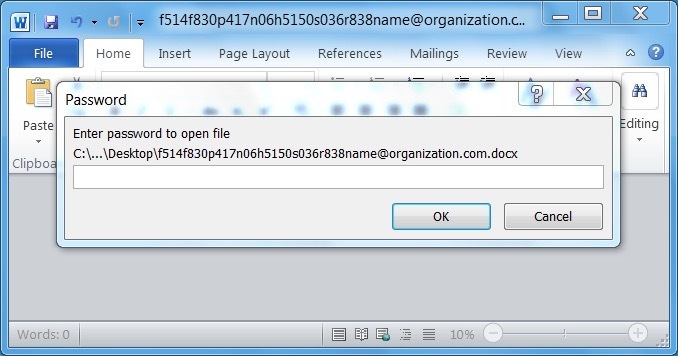 This tactic typically allows the document to bypass detection in anti-virus tools. Searching VirusTotal for the Word document showed 0 of 56 detections when I checked the file later that day. Shown above: Request for the attached document's password. 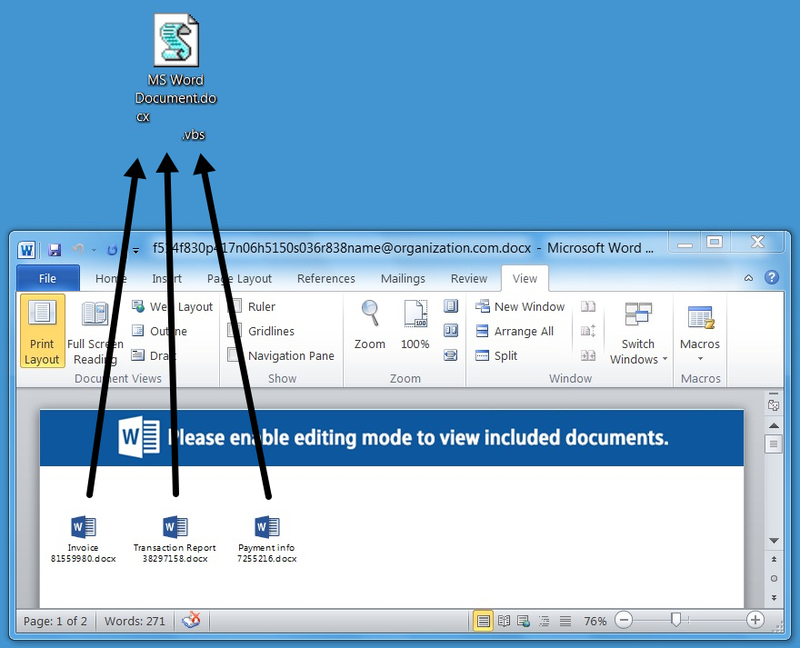 The document had three embedded objects that were supposedly Word documents. 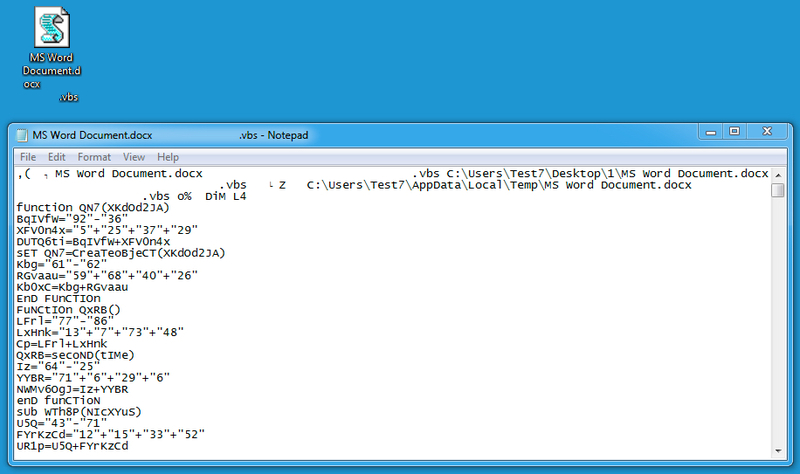 Dragging and dropping the objects onto the desktop revealed these were the same Visual Basic Script (VBS) file. The file name had several spaces before the .vbs file extension in an attempt to hide the true nature of the file. Shown above: The embedded objects were a VBS file. The VBS script was obfuscated, so its purpose was not immediately apparent. Shown above: Text from the embedded VBS file. Executing the VBS file on a Windows host in my lab generated HTTP traffic. This is typically an attempt to download additional malware like a Windows executable or DLL file. Unfortunately, by the time I checked it, the URL returned a 404 Not Found error. Shown above: Traffic generated by the .vbs file. 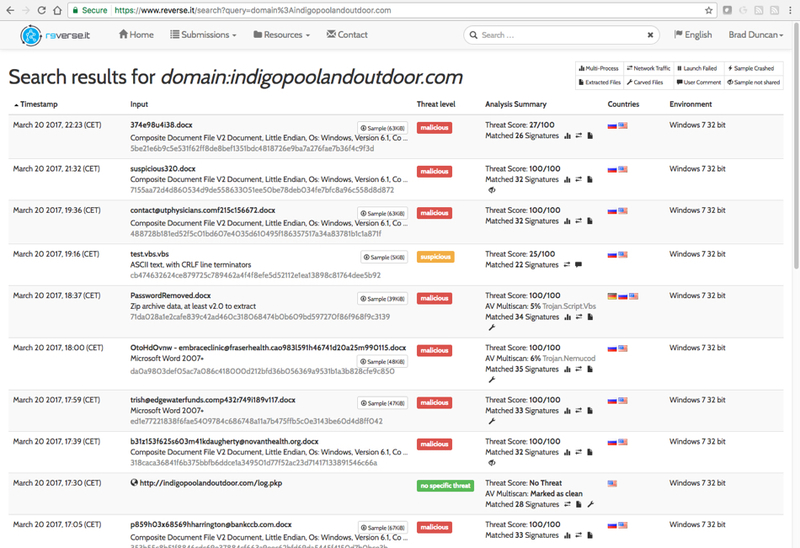 I searched reverse.it (also available as Payload Security on hybrid-analysis.com) and found 21 items submitted on Monday 2017-03-20 associated with the domain. Most were other documents from the same type of malspam. Two were attempts to analyze an extracted .vbs file. One was a query to the callback URL. None of these examples made it any farther than I did. NOTE: Getting these search results on reverse.it requires a login. The accounts are free and only require a name, email, and password. Shown above: Search results on reverse.it (hybrid-analysis.com) for the callback domain. 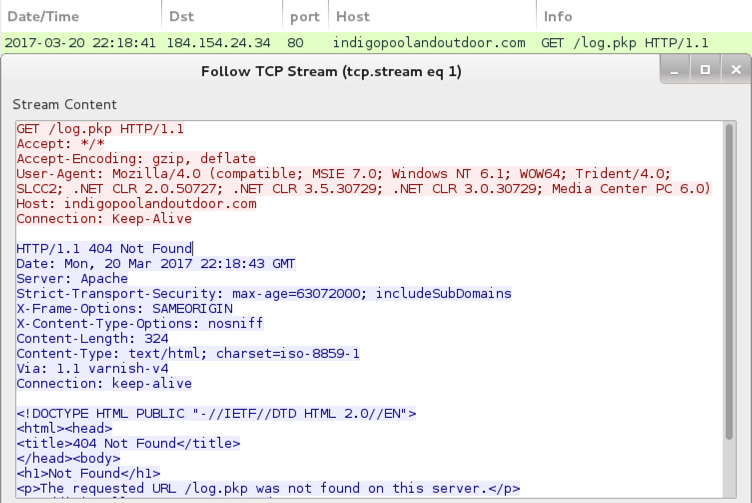 Last week, someone at cysinfo.com blogged about similar malspam designed to infect Windows hosts with an Ursnif banking Trojan. This type of password-protection technique in malspam attachments is nothing new. I've certainly seen it before, and some creative Google searching will reveal this started years ago. However, I haven't seen much about this in public forums lately. Most security professionals assume we all know about it, so it doesn't usually make any headlines. I advise people this is still a thing. Of course, properly-administered Windows hosts are far less vulnerable to this type of infection. The hosts I use in my lab environment are a different story. If anyone knows of someone who was actually infected from one of these password-protected documents, please share your tale in the comments. Thanks for the post. I have seen a wave of this particular malspam recently as well. I have been capturing it daily for the past couple of weeks. According to MS Documentation of OpenXML when a password is used the file is encrypted. As you mentioned each file (and we can assume password too) is customized per payload per email, hence classifying one email or document as malicious in a IDS/IPS/firewall / email filtering system or VirusTotal does not help identify other malicious payloads, because they look completely different. Quoting Anonymous: According to MS Documentation of OpenXML when a password is used the file is encrypted. That's a good point. The encrypted version is certainly a different set of bytes than the unencrypted version. If you can share what Lab Env. you set up to execute Malicious documents so that we can have the similar set up. We've been seeing more of these over the last couple weeks. Initially they were getting through Mimecast's attachment protection, but we quickly modified our policy to hold all encrypted attachments. But it seems like a good way for the bad guys to get around email protection if you're not paying attention. By the way, Brad, I saw your presentation at the EISC a couple weeks ago. Good stuff. @Anonymous: Unfortunately, I cannot share the details of my lab environment, especially in a public forum. @Jeff: That's a good policy to set for inbound email. Thanks for the kind words! I've got a sample from a few weeks ago. I believe it's ransomware. @m0nst3r, if you submit it through our contact page, someone might be able to look at it. Thanks! Each time I need to analyze something, I just spin up vm's in isolated test areas I have set up in Google Compute or AWS. After I am done I destroy the vm's and move on. Okay cool, is a VT URL sufficient or would you like the downloaded payload zipped and password protected? @m0nst3r, a VT URL will work. This email (user@domain.com) [email address always matched recipient] was used as the addressee of the payment. Please find the invoice (also saw bill or IOU) enclosed with this msg Payment will be posted in 30 minutes. Is there a way to safely remove the password requirement without having to open the word document assuming you know the password? Any CLI/CMD commands to run that would do this?